This nice paired dog tag necklace are made of sterling silver, with a little heart cut out in the mi.. The FingerPrint Ingot made of 925 sterling silver measures approx 4.3cm by 8mm wide each. Engraved w.. 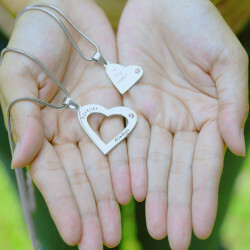 Style: Name Necklace/Love Necklace Pendant Size: -- -- Hook: Single Hook Chain type: Rolo Chain Mate.. Style: Name Necklace/Love Necklace Pendant Size: 3x2.3cm/(1.18"x0.9") Hook: Single Hook Ch.. Band width: 3mm Diamond diameter: 1.5mm Whilst these rings are shown as in stock, all of our rings a.. Style: Name Necklace/Love Necklace Pendant Size: 3*3CM(1.2*1.2") Hook: Single Hook Chain type: .. Mothers and daughters share a very unique bond that can never be unbroken. Show this bond with the&n.. The love between a mother and daughter is forever, and it can be easily seen with the Mother D.. The Engraved His and Hers Necklace for Couples is the perfect way to show how much you l.. According to Chinese philosophy the yin and yang represent light and shadow, complimentary forces wo.. This Set of Two Sterling Silver Angel Wings Necklace is a perfect gift! Looking fo.. Style: Name Necklace/Love Necklace Pendant Size: Two Pieces Size:2.55*2.55CM(1.02*1.02INCH) Hook: Si..
Each pendant is approx 35mm by 12mm. A lot of times they are treated to make them look better and la.. Style: Name Necklace/Love Necklace Pendant Size: 1.3*3.5CM(0.52*1.4") Hook: Single Hook Chain t..